My go-to work pieces have changed since but this winter/colder weather has rolled in. I rely on tapered trousers and flowy tops these days to keep me warm and looking office ready. Being 5'4" it is sometimes hard to find trousers that are the correct length without needing to be hemmed, but these Vince pants fit perfectly (and I love the black stripe on the black!). 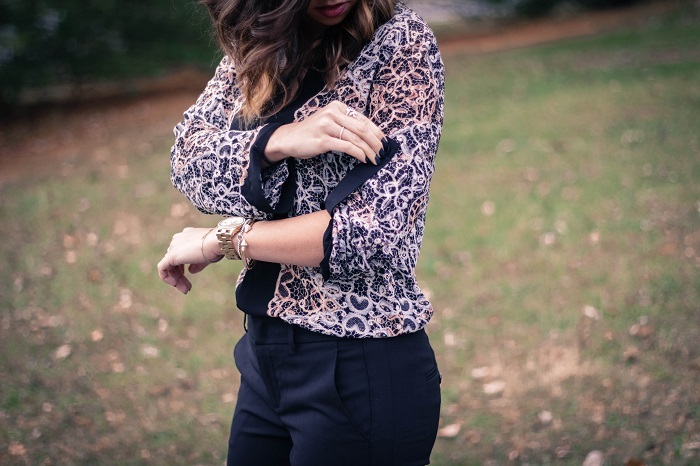 This great great BCBG top adds to my recipe for an easy office outfit. Oh my gosh I am in love with this top! So easily dressed up or dressed down! Love this Andrea!! So chic and classy! You are oh so chic! I love both of these pieces! The heels you paired them with are perfection. I finally caved and ordered some nice trousers myself because I was freezing in my ill-suited cold weather work wear! I really like those pants! I've been on the hunt for a good black of skinny or tapered black pants for work. I'll have to look into these. Happy Holidays!